These aluminum grommets are used with FJ and FA series studs. They serve two important purposes for the fastener's proper installation. First, they protect the panel hole from enlarging due to vibration and fastener cycling over time. Second, they retain the stud in the panel when it is unlocked so the fasteners do not fall out and get lost. 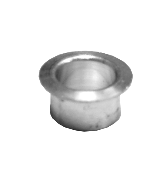 Each stud diameter (series) has it's own corresponding grommet diameter. Also, each stud/grommet series uses a specific tool set for installation. For example, FJ4-35 studs use GF4 grommets with the MS-F4C tool set. The grommets come in different lengths and this length is determined by the thickness of the outer panel in which the fastener will be installed. See the part description for the panel thickness range of any particular grommet. If you have any questions about determining the correct parts or need any help at all, please Contact Us, we will be glad to help.